I was recently contacted by the PR Department for Skin MD Natural Shielding Lotion and asked if I would be interested in doing a product review and giveaway for their lotion. My reply was...I would be happy to give it a try. First let me tell you about this fantastic product. The Skin MD Shielding Lotion is manufactured here in the USA by a company called 21st Century Formulations, based out of Beverly Hills, CA. If you've been looking for a skin care product that can heal dry skin and keep the ravages of time at bay, take a look at a breakthrough based on years of research by doctors and chemists - shielding lotion. A Shielding Lotion is far more effective as a dry skin treatment than conventional moisturizing lotions or protective creams. If you suffer from dry skin, you know that just using a moisturizing lotion doesn't solve the problem. The company sent me several sample packets along with a full size 4 ounce bottle to try out. I got the package 3 days ago and immediately got busy trying out the product. Here are my personal results: Since I have extremely dry hands from frequent hand washing, I decided I would first try it out on my hands. I applied a pea-sized dab of lotion to each hand and rubbed it in for 10 seconds. Yes...you read that right, 10 seconds! Unlike messy, greasy and oily conventional lotions, this shielding lotion is quickly absorbed into the skin. Within 5 minutes, I noticed that my hands looked more youthful and less dry. Wow, I was so impressed with the shielding lotion so I decided to tear off my socks and put some on each of my feet and then I put on a clean pair of chenille socks. Later that night when I took my socks off to go to bed, I noticed that my feet were 50% softer after just one use of the shielding lotion. There is nothing worse than laying on soft cotton sheets and having your dry skinned heels snagging up your sheets! The next morning I decided to try some of the shielding lotion on my face so I used a dab of lotion about the size of a nickel and put it on my face in my T-Zone and cheeks area. Within a few minutes I noticed a visible improvement in the redness, dry blotchiness and flaking that I normally have in those areas. Furthermore, when I went to put on my foundation, it just glided over the areas that I had applied the shielding lotion. Yeah!!! Finally...a light-weight non-oily lotion that can be used on the face and under your makeup! I have personally been using this fabulous lotion supplied to me by the generous folks at Skin MD Natural for the past 3 days and I can tell you in all honesty, I will now be a life-long user of this product! If you are a chef, cook, waitress, doctor, nurse, daycare provider or a parent who frequently washes your hands, you need this product too! Plus...I get contact dermatitis when I wear certain rings on my fingers. Yesterday after I applied the shielding lotion, I put 2 rings on that normally cause a reaction for me...been wearing them for 24 hours now & no reactions!!!! 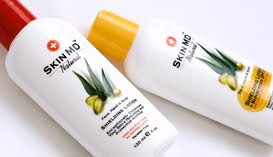 Thank You Skin MD Natural for giving me a bottle of your fantastic shielding lotion to review and to giveaway here on the Shakin 'N Bakin In The Kitchen with Shelly Blog! Disclaimer: I have not been compensated in any way for this giveaway other than receiving a FREE bottle of Skin MD Natural Shielding Lotion. My thoughts, opinions and words are my own. Please read my Terms of Service & Dislaimer Polices before entering this giveaway. This giveaway is open WORLD-WIDE and will end on February 25th, 2010 at Midnight EST. #1 Follow Skin MD Natural on twitter. #2 Follow Skin MD Natural on twitter. I love it living in CA, without humidity, my hands are really dry, I would love to try this, however when I punched in CA it comes up there are no stores in my state???? :( but I did grab your button, and I became a follower of yours, guess I would then have to buy it online.. I do facebook does that count??? As I age the dry winter months are really taking their toll on my skin. The shield will help a lot.